The Griddler Jr. maintains the best of the Griddler family traits and has a more compact build to fit comfortably on any countertop. 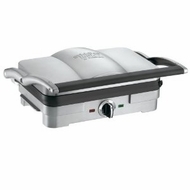 It can be used three different ways to prepare a variety of favorites-steaks on the open grill, crisp-grilled sandwiches with the panini press, or burgers cooked to perfection, both sides at once, with the contact grill. Make big plans with a small package!